Superstar author Jacqueline Wilson takes a frank and captivating look at her own childhood in this autobiography. It’s a tale of friendships, loneliness, books, toys, family and much more. Read it to see how Jacky played with paper dolls like April in Dustbin Baby; how she sat entrance exams like Ruby in Double Act, and how – just like Tracy Beaker – she loved writing and making up stories! Funny, warm and moving, this book shows how Jacqueline Wilson started to become a writer, and where she got her inspiration from. Really, Really good. A must read! This book caught my eye in stores, and after reading it, I became an instant Jacky fan. While taking readers on a journey through her childhood, Jacqueline Wilson has produced another hit among children. This is now one of my favourite books! 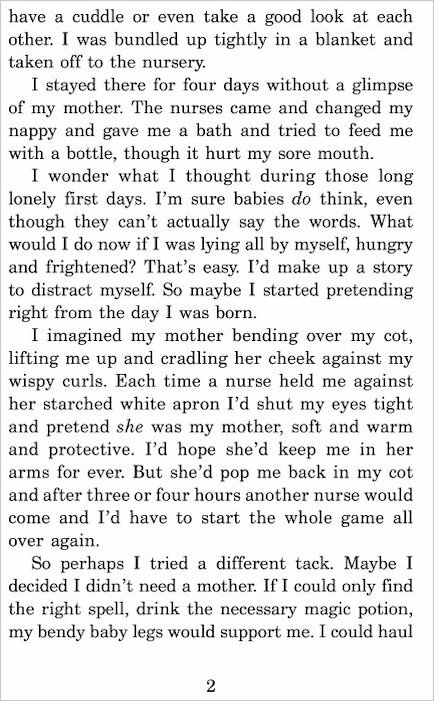 i liked it but where is the rest of the book. There was only a little section of the book. If any body else knows where the full book is tell in the review. good but sometimes repeats her self on the books she read as a child! i loved this book, the story of Jacqueline Wilson’s life. This is a great book, I especially like the front cover which i think is by Nich Sharratt. This autobiography was well written and it was quite sad. this book really inspired me to start writing stories I am currently in the middle of writing one but this really touched my heart and made me think about how alike we are this is a great book love it! I love it a lot! This book is really brilliant! 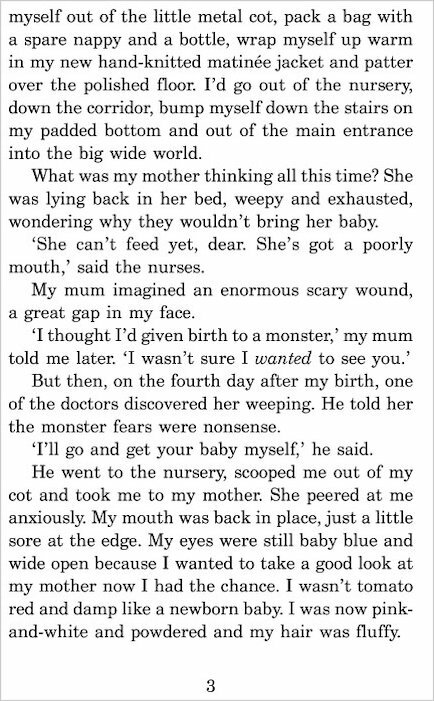 It’s very interesting to see how Jacqueline Wilson’s childhood was like. 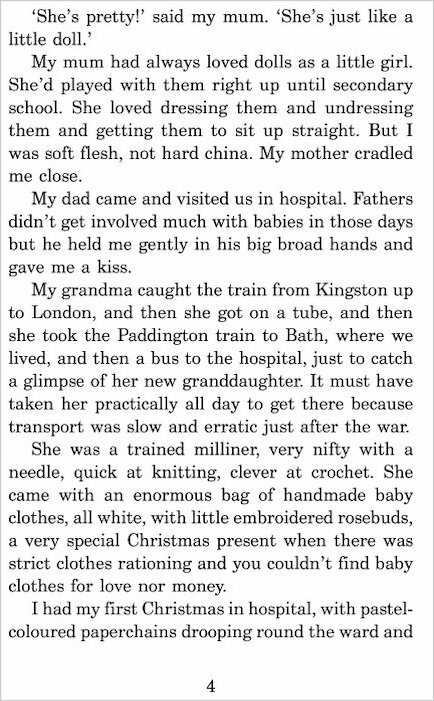 I also was really intresed to see that some of the things in her books she has expirenced to for example her best friend’s mum has cancer just like Jayni’s mum in Lola Rose,also that she used to play with paper dolls when she was a child just like april in dustbin baby. I would definetly recommend that any mega fan of Jacqueline Wilson should read this book. i realy want this book hopefully i will get it and read it i love jackies books! she is amazing i bet this will be a fav! i will give this a love it star! a must read book!! Jacqueline Wilson is THE author to go to when looking for a good book for young girls although to be honest her old stuff is a lot more interesting and meaning compared to the new. classics such as Double act and Best of Friends and don’t forget the story of Tracy Beaker. This book is the story of her life. This book is Jacqueline Wilson’s autobiography. A must read if you too love the author. I liked reading this book. I liked. Learning about my favorite author .I think this book is really good . an amazing autobiography. a must read. 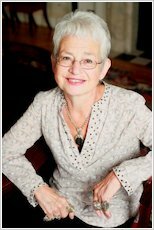 if you love Jacqueline Wilson then you would want to know about her childhood. So good ! About Jacky’s past. So interesting! This book is all about Jacqueline wilsons past when she was small. I love this jw book soooo much! Most of my friends werent sure about this book because it didn’t have a story plot but I loved it!! I thought it was a very interesting book because even though there wasn’t a story plot, you got to see what it was like to be Jacqueline Wilson when she was younger and what it was like living with her family and growing up. I would recommend this book to anyone who likes an autobiography. Well done jackie!!!! I like this book very much. It’s very interesting. it’s good to know what Jacqie did at my age so thats awesome !!! This book is like a biography of Jacqueline Wilson’s childhood. I found it very intresting. You learn lots about Jacky. jacqueline wilson has had an interesting life and i thoroughly enjoyed reading about it. This book was different. I like the way it was set. I adored Jacky Daydream, simply because I adore Jacqueline Wilson. I also loved the way it was an autobigoraphy but written for children, so ti wasn’t a bit tiresome and boring to read, but exciting and colourful, and most certainly enjoyable. 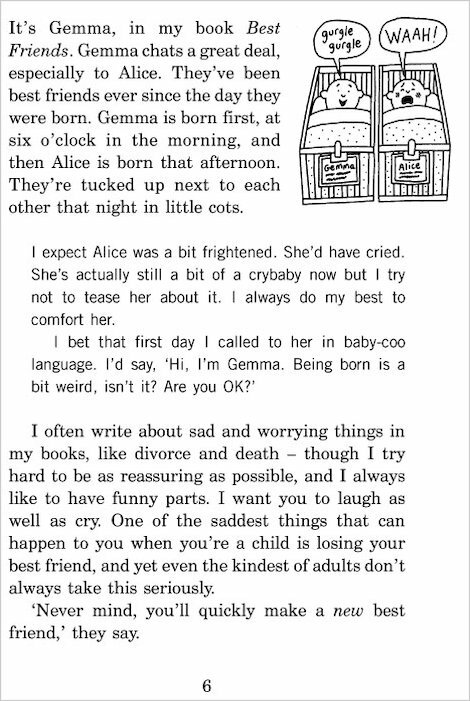 This book is all about Jacqueline Wilson’s childhood.It starts from when she was a baby and up till teenage years!!!! Pure gold. Really makes you think about one of the UKs best authors ideas! this isi a really interesting book about jacqueline wilson’s childhood it also has a quiz question from each chapter about one of her books it is very interesting the first bit is slightly gory though i would reccomend thiis book to any jacquelinre wilson lover!!!!!! Jacky will be author of the month in March. Look out for our very special competition where you could win a personalised, signed copy of her new book, The Worst Thing About My Sister! Awesome!!! Could read it a billion times, funny and sad but cool! This is a really good book, really cool to see what Jacky was like when she was young! Well I’ve not finnished this book yet but I give it 5 stars so Far!!! It’s good but bad title it only mentions daydreaming like once! I love it when she tells us that when he was born she was put in the nursery an d when the nurses came after every 4 hours she’d just think that was her mother. She also tells us that she shut eyes and imagined that her mother was holding her. She’s never open her eyes she was waiting 4 the day when her mother picks her up. She tells us that when her mum picks her up for the first time she says ” she’s just like i imagined” that makes her very happy. Wonderful book, about Jacquline Wilson’s life. Ilove it!!! I loved this loads and found it really interesting! I LOVED IT SOO MUCH! i love this book, im always reading it. not so good.i wouldent let any of my family read it because its so bad its so horrible and boring.i thought it’d be good from its title but its totally not!i just read a couple of pages and returned it back to my school libary.its not worth reading it. not for anyone and not for me! It was an okay book because you get to know loads of facts about Jacqueline Wilson (I’m a fan of hers), but it kind of starts to get a bit boring. Not really good, but i love her other books for definite! She’s my number one author! This is my fave jw. It is all about her childhood. There are also super pics!!! I love jacky daydream!!!!!! I have read this wonderful auto-biography, but some how I think I like fiction stories more. I like the themes, the reality and the ways Jacky had gone through in her marvellous life. I would rate it 10/10 if you liked auto-biographies and info, but for me I would rate it a positive 5/10. This book was very interesting and i never knew Jacqueline Wilson was like that!!! I have read this book and I thought it is a very well written and interesting book. It tells you lots about Jacqueline Wilson herself instead of her amazing and creative characters. In this auto-biography about her you find out about her teachers, schools, parents, outings, holidays and friends. Yet again Jacqueline Wilson has written another brilliant book that I would recomnend to anybody. I liked this book because you can really get to know Jaqueline Wilson more, and her personality! I’ve read Jacky Daydream and it was so interesting learning about what Jacky. I loved it and I would reccomend it to 7/8 years plus. I suggest to you that you should…READ THIS GREAT BOOK!!! I haven’t read this. I love Jaqueline’s books. i loved this book i would never have known so much about jacqueline if i hadn’t read the book ! I have read Jacky Daydream and i thought it was a realy good book to read.As soon as i had read it all my friends started to read it to because they thought it was such a good book toooo. this was a fantastic book and I really enjoyed it. It shows you that her mind was ful of imaganation from the minite she was born. Most of you liked the book, Jacky Daydream and rated it 5 stars well this book wasnt for me, it just wasnt my cup of tea. I found it pretty boring and I couldnt get into it but I read it because it cost me £8.00. I baught it because all my friends had it! I’m going to read Jackys new book, my secret diary to see what it’s like! Let’s hope it good. jacky daydream is amazing. it’s all about jacqueline wilsons childhood. who would have thought that jacqueline played with paper dolls like April in Dustbin Baby. the reason why i love the book is because i’m so fond of jacqueline wilson.if u are a fan this book was made for you! at first i found this book hard to read but eventually i enjoyed it. i am currently half way through it. This was a great book 5 stars.I have read it twice.I hope Jacqueline Wilson writes about her teenage years too! I LOVE LOVE LOVE this book!!! I’m a huge Jacky fan and I loved learning about her childhood. Who would have ever thought she would grow up to be so successful?! This book is amazing! JW used to be my first fave authour but now I am still a fan, but I think Terry Pratchett, Enid Blyton, Karen Mc Combie etc. are all much better authours. But I do recommend it!!!! It is for all JW fans!!!!!! Jacky Daydream is really special to me as Jacqueline Wilson is probably the best childrens author of all time, for me anyway. This book is funny, interesting and is a lot of fun. You should read it!!!!!! The book was OK, but just not the type of book that I’d like to read – but maybe for someone else. I found that this book babbled a bit, and it was kind of in a messy order. Personally, I prefer her other books but this one was a OK book. I won’t say it’s rubbish, because it’s not, but after a while of reading it just bored me a little. 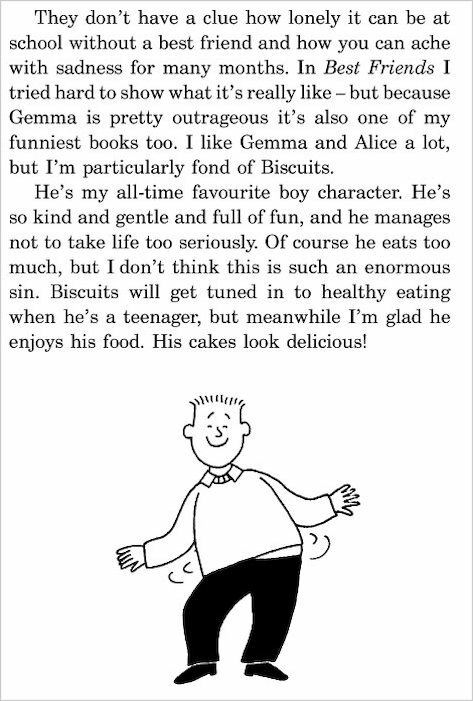 But Jacqueline Wilson is a very good writer, to be honest ;) This by the way, is just my opinion. Some of you could really like this book. 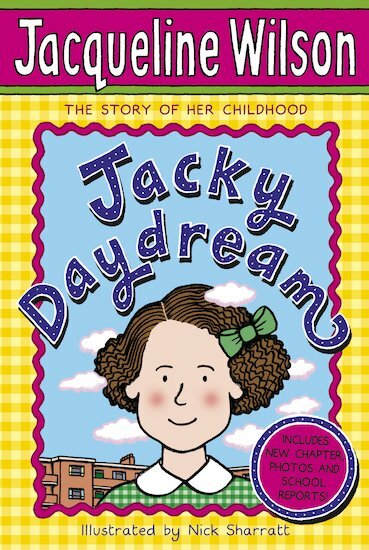 jacky daydream is an excellent book about jacqueline wilson`s life when she was younger. it is like she is telling you the whole thing of stuff like what she did and where she went for holidays and all kinds of things. i have been so inspired by all of her books that i would someday like to become a famous writer but just now i am going to have to stick to writing stories on peices of paper and writing reviews. i hope you like her books too and enjoy them as much as i do . This is a brilliant book all about Jaquelines Life.It starts off as she is born and finishes right at where she is now. I would reccomend it to any person girl or boy. I’d give it * *stars!